Beaver ponds are splendid for your water-loving dog and so is Lake Frances; even Nescopeck reek is deep enough for superb dog paddling in spots. 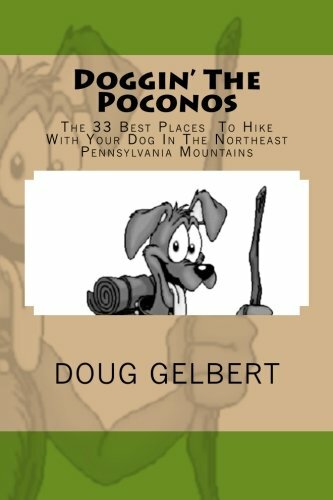 The Glen Onoko Run tumbles 900 feet down seven waterfalls in less than one mile and your dog can hike to the top, moving almost straight up at times, hopping across the stream and picking his way at others. After hiking the magical Y-shaped Falls Trail that visits 23 named waterfalls along two branches of the Kitchen Creek your dog will know why this area was once slated to be a national park. The hike up 1,463-foot Mount Minsi is a tough rewarding climb either on an old fire road or the twisting Appalachian Trail to views of the famous gap. The Flood of 2006 destroyed large chunks of the Falls Brook Trail, one of Pennsylvania’s most spectacular footpaths but the adjoining Hemlock Trail helps to deliver the park’s three signature waterfalls. The Switchback Trail travels on the roadbed of one of America’s first railroads. After it closed the gravity railroad spent time as one of America’s first rollercoasters and a popular destination for thrill seekers. Bruce Lake is one of six glacial lakes in the forest; the route combines wide, plaw-pleasing logging roads and the usual rocky Pocono paths as it rolls along. Like the early settlers who named this remote valley, you will feel like you are hiking through the end of the world in these mountains. If the park’s 20 miles of trails don’t do the trick the 60-mile Loyalsock Trail should accomplish the feeling.